In Winter, spring and autumn we are flexible with the length of your stay and with changeover day allowing you freedom to choose your travelling dates and plans. Please contact us with your ideal plan and we will always try to accommodate your wishes. This is particularly popular with those wishing to explore more than one region of France or people on walking, fishing or house-hunting trips. For short stays from 1 night we provide everything you will need including a generous fresh breakfast with artisan breads and viennoiseries served in your own apartment or in our 16C dining hall. You will enjoy your own private sitting room with satellite TV, garden and a kitchen should you wish to prepare yourself light meals. For single travellers to families or larger groups we are happy to offer a totally flexible break to fit in with your requirements in any of our self-catering gîtes. 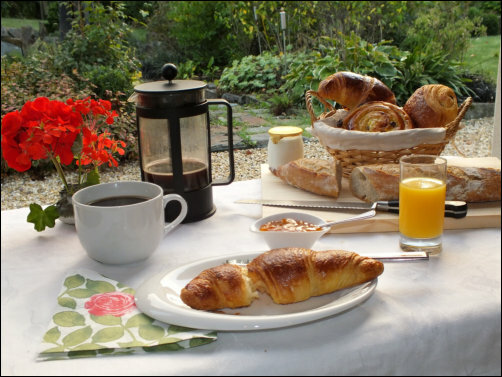 We can include breakfast, occasional meals or packed lunches if you wish.